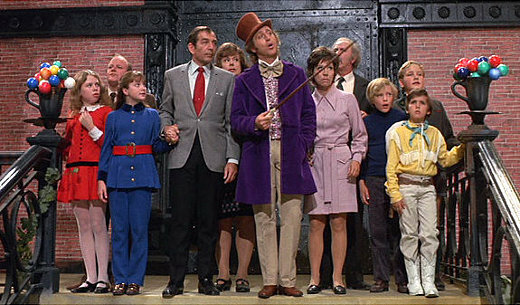 For whatever reason Willy Wonka and the Chocolate Factory keeps sneaking its way back onto this blog. First there was a Letter of Note in June about Gene Wilder's thoughts on the title character's costumes; then my Mel Stuart obituary from earlier this month; and now another Letter of Note written by Stuart to his producer David Wolper. Stuart's letter (which you can read here) is mainly taken up with voicing his concerns about production delays caused by the filming of the Chocolate Room. He goes on about the lengthy turnaround period between shots, and how they lost a whole morning's shooting time due to the waterfall breaking down. But in the later stages he turns brighter and more optimistic, praising Gene Wilder's performance as "one of the most extraordinary performances ever seen in a fantasy musical." Perhaps the persistent reappearance of the film on my blog and in my emails is some kind of sign that I should give this film another go. Who knows - maybe I will? There's a lot of other films backing up that I need to do - not least my upcoming review of Take Shelter - but rest assured, I will get round to it. Soon.